I.G. Farben "Is Not Dead!" Their Concentration Camp Is Still Producing Lethal Chemicals+++ , Drugs++++ and "Now Frankenfood!" during my 1969 through 1977 tours with the US Army in Frankfurt Germany. It was an experience+ I will never forget. Watch the YouTube video "War on Health" with mention of Farben in it. 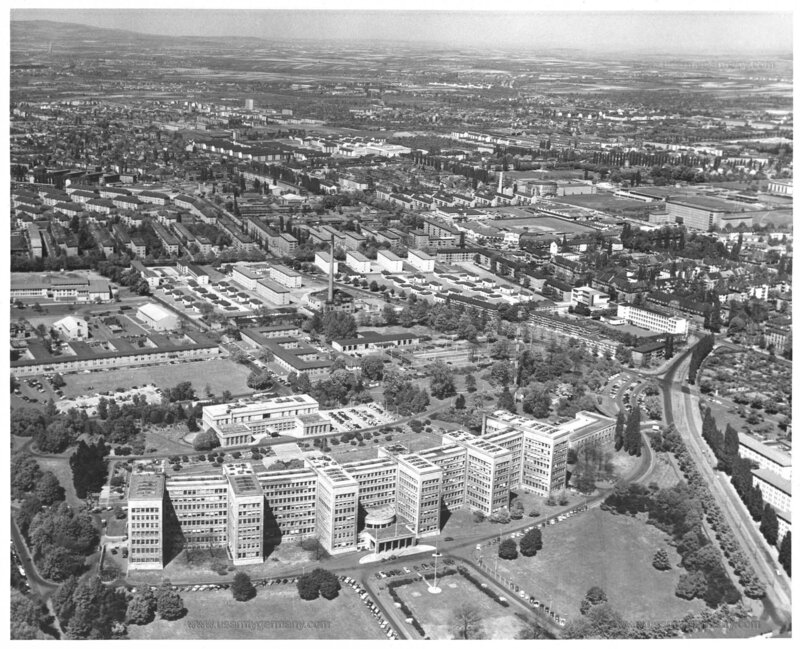 The photos and other document are showing that I attended the Frankfurt American High School is/was located directly behind the Farben Building as seen in photo of the Farben complex to the left. In grad photo I am top right on chapel steps +. At the top of this page you will see the Farben Building & "the church" (?) still standing (invested interest protected) with everything else around bombed during WWll. Is the course of history being changed right before our eyes? Headquarters V Corps was in Frankfurt at the I.G. Farben Building? View new news here? also in Frankfurt's I.G. Farben as can be seen in the body parts in this clip. "Lives On To Deceive Mankind!" SS, because the Red Cross was connected with the SS and all its leader were members of the SS. President of the German Red Cross was Ernst Robert Grawitz. Treasurer were SS-Gruppenführer oswald Pohl and the signer of this document, Hans Ludwig. No Matter How Many They Maim or Murder! The Pattern of Farben THE HUGE INTERNATIONAL chemical combine and cartel leader that is known today as I. G. Farben had its beginning some seventy-five years ago, with the founding in Germany of six small coal-tar dye companies. By 1939 these six companies had grown into the ominous-sounding INTERESSEN GEMEINSCHAFT FARBENINDUSTRIE AKTIENGESELLSCHAFT, of FRANKFORT am MAIN, which translated literally, means community of interests of the dye manufacturing companies. I. G. Farben is usually discussed as a huge German cartel which controls chemical industries throughout the world and from which profits flow back to the headquarters in Frankfort. Farben, however, is no mere industrial enterprise conducted by Germans for the extraction of profits at home and abroad. Rather, it is and must be recognized as a cabalistic organization which, through foreign subsidiaries and by secret tie-ups, operates a far-flung and highly efficient espionage machine the ultimate purpose being world conquest and a world super-state directed by Farben. Hillary Presidents Campaign? Dr. Oz Mazola corn oil & Bayer sponsored Non-GMO SOY? Sixty-four other countries banned GMO's (DNA) but "Oz" said it is the pesticides & not the GMO's? AGENT ORANGE FOOD - IN YOUR LOCAL SUPERMARKET NOW? to their people in the white coats. Without disease and suffering they know they can not profit. So your food is what they target. Followed By Pain & Suffering! and soil. Our bodies are not designed to eat food chemicals or RX "chemical drugs". For Them To Line Their Pockets With Gold And Silver! eat healthier to put an end to most of the pain + and suffering! grow your own poison free gardens organically indoors or in a greenhouse! RX chemical drugs into you! "FARBENS AUSCHWITZ LIVES ON IN AMERICA"